I finally found the time over the last couple weekends and got around to building some accessories for my 26er I’ve been wanting for a while now. The baskets are just regular Webers with some expanded steel on bottom. The drip pans are made from a 22” aluminum pizza pan I found on Amazon. I liked how well the first one that I built for the medium basket fit, I ordered a second one and cut it to fit around my Poortex. It also fits like charm on a 22” up top if I want to use it as a griddle. The big basket got broken in last night with some salmon & oysters. I hope to test out the drip pans soon! Very nice. Still need to make some big baskets. That’s pretty friggin’ cool, well done! Thanks guys. I just spent a good chunk of time reading the thread about the new MT Premium, and now I’m wondering if I could use the new baskets and the side-cut drip pan just like the diffuser plate in that one. I’ll have to play around with the configuration next time I’m messing around with the grill. (So, soon, probably.) I just wish my 26er had those new P-shaped bottom vents. I think those are the best feature of that new guy! Nicely done! All very practical mods. Are you planning to line the drip pan with aluminum foil? Just wondering because the way it's designed, you will run into problems. Wasn’t really planning on it. I’d probably rarely, if ever, use it as a griddle. (I’ve never found much use for one.) I’d give it a try though. It’s more about channeling the air intake through the side basket or center. I figured it would help a little with bowl cleanup, but I really don’t mind scraping a little crap off the bowl every few weeks. What problems do you envision? The problem is the drip pan being too close to the charcoal holder. Aluminum is a very good heat conductor so it will get very hot. Oily drippings will start to smoke profusely and it will impart a nasty taste on the food. A bigger issue is that the oily drippings can catch on fire especially since there's no inside lip on the drip pan. 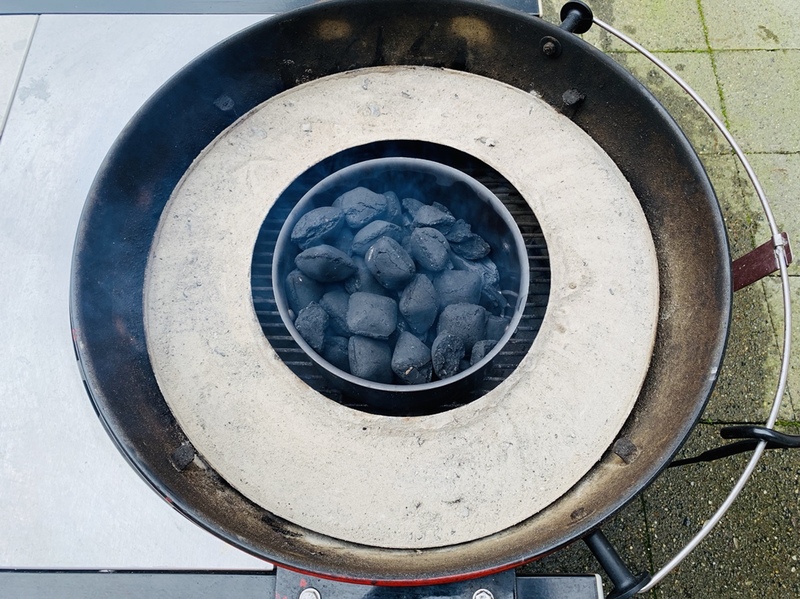 Oily drippings will drain adjacent to the charcoal holder increasing the likelihood of catching on fire. You need at least 1/2" gap between the drip pan and charcoal holder. Also stainless works better since it's a much poorer heat conductor in comparison to aluminum. 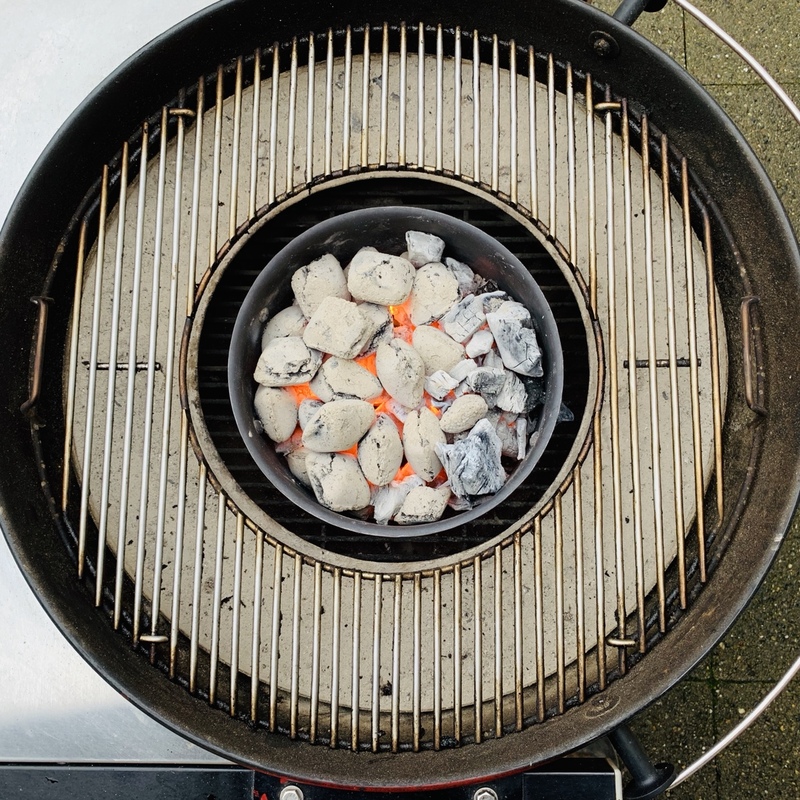 Even with a 1" gap between the drip pan and charcoal holder, it still gets hot enough for oily drippings to smoke. Drip pan is filled with ash to act like a kitty litter. Ash absorbs the oily drippings and prevent it from smoking during high heat cook. Makes clean up easier also. I just dump it every couple times i cook oily meats and replace with new ash. 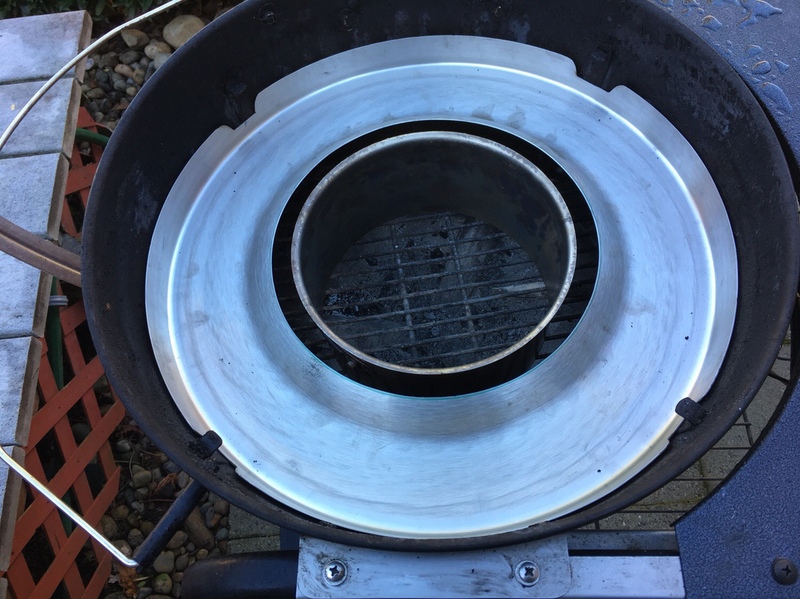 If you want a drip pan for your 26 with lips on both the inside and outside perimeters, a 22" convex comal will fit perfectly. Just cut out the center portion. Well damn, Jules. You really know how to take the wind out of a guy’s sails. J/K I appreciate the input. I just wish I’d posted these ideas PRIOR to spending money & time on this. I like the ash idea; seems like an easy partial solution. Do you think wrapping with foil would actually help with the flare-ups, even though it’s made from aluminum as well? Or was the wrapping idea just so I could form a lip near the cut edges? Didn't mean to burst your bubble. Just giving you heads up on the possible problems that you may encounter. Wrapping the dip pan with aluminum doesn't really do much other than facilitate clean up. Baked on drippings on an aluminum pan is very tough to clean thoroughly . So if you cook fish on it etc, it can impart a pungent smell/taste on your other cooks. Also, avoid using aluminum as a heat diffuser or griddle. What was the mesh you used on the baskets? I did the same for my 22.5 and was going to SS 1/4X1/4 mesh. Just a $10 sheet of expanded steel from HD, cut with an angle grinder. Thanks @Jed.cook . I like the way it works with the smaller pieces. I may try to bend it all the way around so I can lift it and get the cooled down fuel out easier for another burn. I just wish my 26er had those new P-shaped bottom vents. I think those are the best feature of that new guy! Do the new 26rs come with P-Vents? Pics?